Please see the following post about the tool I wrote to automate this analysis. I’ve often wondered about how a Smartphone GPS would stack up against a purpose built wilderness GPS. I suspected that it would not perform as well because the GPS antenna is not as big. Following up on yesterday’s post on how to measure GPS accuracy, I did the same experiment on my smartphone. I gathered the data using the same procedure as I outlined in the previous post; in fact the data presented here was gathered at the same time. Both my wilderness GPS and the Smartphone were placed in a location with a clear view of the sky, and set to record positions for the same length of time. They were placed about 3 meters apart. 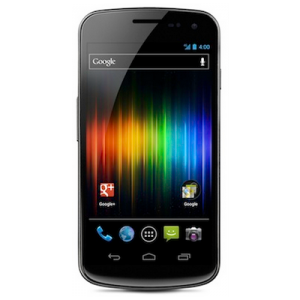 My phone is a relatively new Samsung Galaxy Nexus. I left the phone with all wifi and other radios on as would be normal for using it. The CEP was calculated at 14.6m, and the 2DRMS was 35m, the scatter plot of the positions and the 50% and 95% rings is presented below. In comparison, below is the chart for the Garmin GPSMap 62st, recorded in the same place at the same time. I’ve re-rendered it using the same scale so you can compare the two scatterplots. As you can see the wilderness GPS is a lot more accurate. Both GPS units were in the same place, gathering the data at the same time. They had the same view of the sky, and should be able to see the same number of satellites. However, the Smartphone has significantly worse accuracy. The 95% confidence interval was 35m compared to 14m for the GPS — more than 2.5 times as bad! This is easily seen in the above charts; when rendered at the same scale, you can see the large difference in variability in the data points, and the much larger confidence interval circles. We can only conclude that the GPS in this phone is nowhere near as accurate as the Garmin GPS. As in the previous post, if you’re interested you can look at the original data for the smart phone here. Was WAAS turned on for the Garmin 62st? Most smartphones don’t have WAAS capability, including the Galaxy Nexus (I have a Galaxy Nexus myself), so the difference in accuracy might be due at least partially to that. It’s also possible to use a Bluetooth WAAS-enabled GPS receiver with Android smartphones, which should improve accuracy somewhat. It will also improve smartphone battery life dramatically – using the built-in GPS drains the battery amazingly fast. WAAS was not on for this experiment (I checked). It would probably have improved the accuracy of the GPS, but the original point was that for the perception of accuracy to meet reality you should double the displayed numbers. I still think the difference in accuracy between the smart phone and the GPS is from the antenna. The smart phone may also be suffering from some interferance since there are so many radios pack into a small place (Bluetooth, WiFi, Cellular etc). In fact my Bluetooth was off, but the WiFi was on. I doubt the Bluetooth/WiFi would interfere much; GPS L1 signal is at 1.5 GHz, while Bluetooth is 2.4-2.8 GHz and WiFi is 2.4 GHz/5.8 GHz. You’re likely right that the antenna size is the critical factor here, though I suspect that the Garmin also uses a higher-sensitivity receiver and better chipset. By the way Leszek, I love your web site; lots of great information there. Thanks! I do actually plan to get it up and running again with new posts in the near future. Hi! This is really awesome information. I am looking at conducting a similar experiment to check the GPS uncertainty of two mobile phones and check their correlation. Which app did you use to log the GPS points over time? Another time I ran on a 400m track, and the data averaging performed by my running app effectively shrank the track to about 320m. Thanks for the GPS Logger app link, I’m going to try that out and see whether the fault is my GPS itself or the way Strava is using it. I’ve long been suspicious of people using the various GPS apps since I know there are inaccuracies. It is possible for the app to apply further filtering to try to smooth out errors, especially if it can “snap” the position to a road like automotive GPS units do. So, while road riding the app might be quite accurate, once you get on a track or go off road it becomes less so. Not a reply but a question: Are you familiar with any smart phones with WAAS? No, never seen an phone with WAAS. Never seen a phone with an external GPS antenna either. Michael I am confused and ignorant to this issue as well. Does WAAS require an additional antenna? Rik, I honestly don’t know if it requires an additional antenna. I rely on the fact that if any Smartphones had WAAS they would advertise it. None of them advertise it. The public and even most backcountry users are largely unaware of the limitations of the system, and now that selective availability is off, the difference between WAAS and non-WAAS is only about 2 metres accuracy. I do know the WAAS satellites, unlike the GPS ones, are geostationary which means that the further north you go, the more likely they are to be blocked by surface features. Even here in British Columbia, just north of the 49th, we can’t receive WAAS on a north facing slope or in a deep valley. Nobody I know has WAAS turned on for their GPS unit (my SAR team doesn’t use it). OK Michael thanks for the prompt reply. For what its worth, I have a Garmin 62stc and a Samsung Galaxy S5. I have used them in unison many times and have downloaded the gpx files and opened them in Google Earth together with different colours for the paths. When viewing the gpx paths against actual paths in a satellite view one can tell where the gps has gone off. My smartphone has just as good or better accuracy than the Garmin 62stc. The Samsung S5’s battery life is also very impressive – It will drain less than 25% of the battery on a 6 hour hike even with a constant data connection. The smartphone has lost reception only twice during a 6 hour hike on Eagle Mountain, but the signal was restored almost immediately. For me, the smartphone is the go-to device and the Garmin is the backup. To note, my prior smartphone (Samsung Galaxy S1) would crash and lose GPS signals all the time, so Samsung has made big improvements with their GPS receiver. Bob, the only way to test the accuracy of the device is to either test it against a known position, or to test the distribution of the error over time which is what I wrote about. Google phones use cell signals, local WiFi as well as GPS to determine location. Testing the phone in an urban area is going to be more accurate than in the bush. This will plot the distribution of the GPS locations, and calculate the 50% and 95% confidence intervals. Make sure to DISABLE wifi for the test. Hi Michael. I know this thread is a while old :) but the link to upload my own tests isn’t working. Any suggestions on how to build an excel sheet for this task? I took down the project to analyze your own GPS track as it costs money to keep it running. 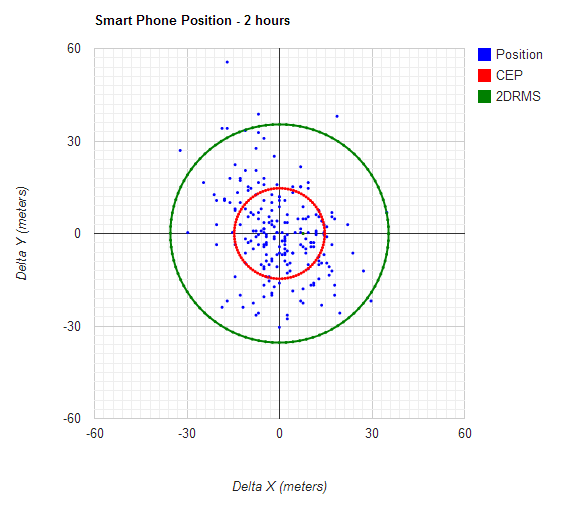 8 Pings/Trackbacks for "Measuring Smartphone GPS accuracy"